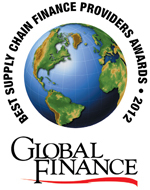 NEW YORK, May 18, 2012 – Global Finance magazine has released its fifth annual rankings for the World's Best Supply Chain Finance Providers to be published in an exclusive survey in the July/August 2012 issue. Global Finance 's editorial team — with input from industry analysts, corporate executives and technology experts — selected the best providers of supply chain financing and management services. A variety of subjective and objective criteria were used for choosing the winners. Factors considered included: market share and global coverage, product innovation, customer service, technology, execution skills and client-specific implementations. "As the financial crisis continues to have repercussions in the real economy, businesses are increasingly looking for solutions to help them manage their working capital more efficiently—and that includes leveraging their credit rating to extend financing to suppliers that would not be otherwise able to obtain low-cost funding. While most companies are still focused on extending their Days Payables Outstanding, they recognize how that impacts their suppliers, and they are looking for solutions to help their suppliers manage working capital as well," said Joseph Giarraputo, publisher of Global Finance. "In this year's awards, we are starting to see a wider range of financing providers participate in supply chain financing deals as banks' credit appetite continues to be impacted by heightened regulation." "The awards recognize those providers and customer implementations that deliver real cost savings, working capital benefits and efficiencies for buyers and suppliers as well as those firms that have developed innovative credit frameworks in order to extend financing deeper into the supplier chain."